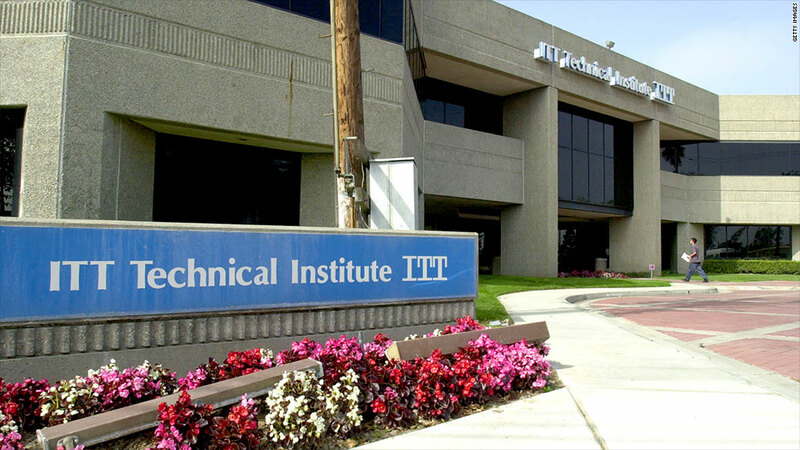 The Consumer Financial Protection Bureau recently sued ITT Educational Services, which operates about 150 ITT Technical Institutes and Daniel Webster Colleges, for predatory lending practices. When Hannah Benbow ran into problems with her for-profit college, she turned to the federal government for help -- but nothing happened. On top of the $120,000 she had already borrowed, the Art Institute of Washington, in Arlington, Va., had told her she would need yet another student loan to cover $7,000 in fees that Benbow said were not disclosed to her before. "Since my parents and family have already co-signed my other ridiculous amount of loans, they were denied on this one," Benbow wrote in her letter to the Department of Education. The letter went on to detail other complaints, such as what she said were exaggerations and misrepresentations about job prospects for graduates and equipment that could not be found on campus. She never received an answer. Chris Hardman, a spokesman for Art Institute's parent company Education Management Corp (EDMC)., said in a letter that all campuses provide services that help students write resumes, prepare for interviews and find leads on jobs. But he did not specifically address Benbow's other complaints. Oversight of for-profit colleges and universities by the U.S. Department of Education -- which declined to discuss the case, or to talk about for-profit colleges -- has been thwarted by the colleges' lobbying and legal challenges. But now, states and other federal agencies are stepping in. Attorneys general from across the country are investigating for-profit colleges accused of leaving students with heavy loan debt and without marketable job skills. At least 32 states are working together to investigate the schools, while several more are working independently on similar cases. California Attorney General Kamala Harris filed suit against Corinthian Colleges (COCO) in October. And last summer, New York announced a $10.25 million settlement with industry giant Career Education Corp (CECO). over claims it inflated graduates' job-placement rates. In cooperation with several states, the Consumer Financial Protection Bureau recently sued ITT Educational Services (ESI), which operates about 150 schools under the names ITT Technical Institute and Daniel Webster College, for predatory lending practices, including pushing students into high-interest loans they couldn't repay. It's the CFPB's first such lawsuit. Corinthian has noted in regulatory filings that the CFPB is investigating its lending practices. The CFPB has not acknowledged the investigation, but the agency has posted on its website a Corinthian document objecting to the probe. The regulatory efforts follow several years of stymied attempts by the Department of Education to impose new regulations on the private, for-profit higher-education industry, and decades of relative inaction by state authorities. "It's very important that states have stepped up to the plate," said Martha Kanter, former U.S. undersecretary of education. After all, students rely on public aid, including grants paid from state taxes, to attend these colleges, said Allison Martin, a spokeswoman for Kentucky's attorney general, Jack Conway. "States are running out of funds to give to students," Martin said. "There's a taxpayer-protection issue here." Related: Will beaten down for-profit colleges bounce back? Critics say the for-profit colleges' lobbying arm, the Association of Private Sector Colleges and Universities, is a main reason the government has not cracked down on the industry's dubious practices. A spokesman for the group's president, former Congressman Steve Gunderson, declined to answer questions. "I think you need every arrow in the quiver," said Margaret Reiter, a former state prosecutor in California who was involved in efforts to regulate for-profit colleges there in the 1980s and '90s. "You're talking about huge businesses with lots of money and lots of influence." But some industry leaders say the various state enforcement actions have muddied the already murky waters of regulation. In Massachusetts, for example, Attorney General Martha Coakley, has pushed hard for new limits on lending and recruiting practices at for-profit colleges. Yet, some of those proposed rules would conflict with federal regulations and accreditors' requirements, said Catherine Flaherty, executive director of the Massachusetts Association of Private Career Schools. "Therein lies the frustration," Flaherty said. "We'd just like one set of rules to live by." Some also worry that the separate actions by states will fragment enforcement efforts. "If you look at the New York settlement with Career Education Corp., that really begs the question, what about students in the other 49 states?" said Pauline Abernathy, vice president of The Institute for College Access and Success, a California-based think tank. New York Attorney General Eric Schneiderman declined to answer questions about the settlement or potential future actions against the for-profits. Attorneys general in Massachusetts and Connecticut also declined to comment. Some other federal agencies may join the CFPB in scrutinizing for-profit colleges. The Justice Department, Securities and Exchange Commission and Defense Department, which objected to the schools' targeting of veterans, all have taken actions against the industry in recent months. Monroe College, with campuses in the Bronx and Westchester County, N.Y., welcomes the scrutiny, said President Marc Jerome. He has been working with federal regulators to help craft new regulations and believes colleges should accept the regulatory complications that come with their business models. "Higher education is a highly regulated area and it's hard enough to operate in one state, much less several," said Jerome. "Schools that have chosen that approach need to deal with it."